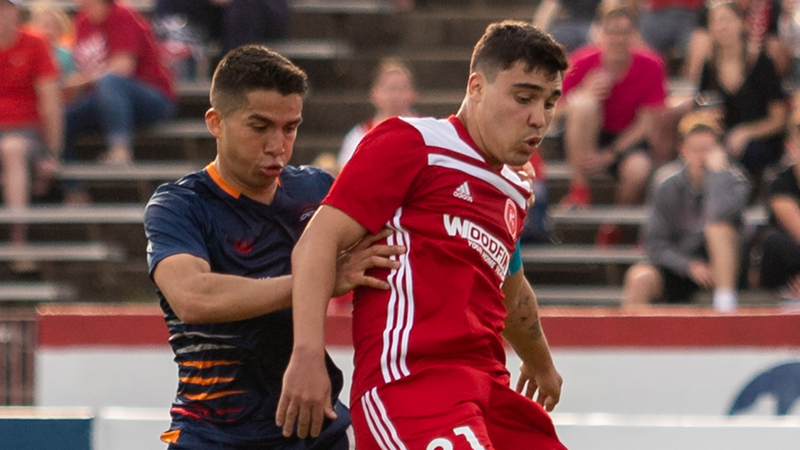 RICHMOND, Va. — (Saturday, March 30, 2019) — The Richmond Kickers (0-0-1) nearly completed the comeback against Lansing Ignite FC (1-0-0) only to fall in the first ever meeting between the two clubs 2-3 at City Stadium Saturday night. Lansing went ahead behind goals from Robinson Moshobane and Xavier Gómez to take a 2-0 lead into halftime. Kevin Coiffic made it 3-0 for Lansing just into the start of the second half. Maxi Rodriguez pulled a goal back for the Kickers in the 68th minute, wearing the captain’s armband. Joe Gallardo converted a penalty in the 76th minute for a final score of 2-3. Lansing found a chance in the 15th minute to get the go ahead goal. Selso Saint-Duc slipped through the Kickers back line and into the Richmond box. He flicked in a cross for Robinson Moshobane in front of goal, as his chance went high and out of danger. Four minutes later, Saint-Duc and Moshobane connected to score the opener. This time, Saint-Duc picked up possession on the left side. As he made his way into the box, Saint-Duc played the ball back for an onrushing Moshobane, curling a shot around a leaping Akira Fitzgerald and into the back of the net. LIFC picked up a second goal in the 27th minute from Xavier Gómez. Nick Moon won the ball in the midfield and made a turn towards goal. Just inside the Richmond box, Moon played a quick pass in the direction of Alex Bruce. The forward left the ball as Gómez made a run towards goal, putting it past Fitzgerald. Coming out of halftime, Joe Gallardo was called for a handball on the edge of the box, setting up a free kick for Lansing in the 49th minute. Gómez stood over the free kick to the left of the box, playing a cross into the far post. Kevin Coiffic came over to head the ball back across goal, sneaking it inside the post. The Kickers pulled a goal back in the 65th minute through the captain, Maxi Rodriguez. A deflected clearance from Grant Stoneman, fell to the feet of Daniel Jackson. The forward played the ball back across for Rodriguez to run onto and smash into the back of the net for his first goal in a Kickers shirt. A handball inside the Lansing box by Kevin Coiffic after a cross by Matt Bolduc forced Danielle Chesky to point to the spot and award a penalty kick to Richmond in the 76th minute. Gallardo stepped up and made no mistake putting it past Mike Kirk. The Kickers nearly completed the comeback in the 86th minute. A free kick just inside the Lansing end of the field by Maxi Rodriguez was chipped over the top and found Ivan Magalhães in a crowd. His header was sent just wide.